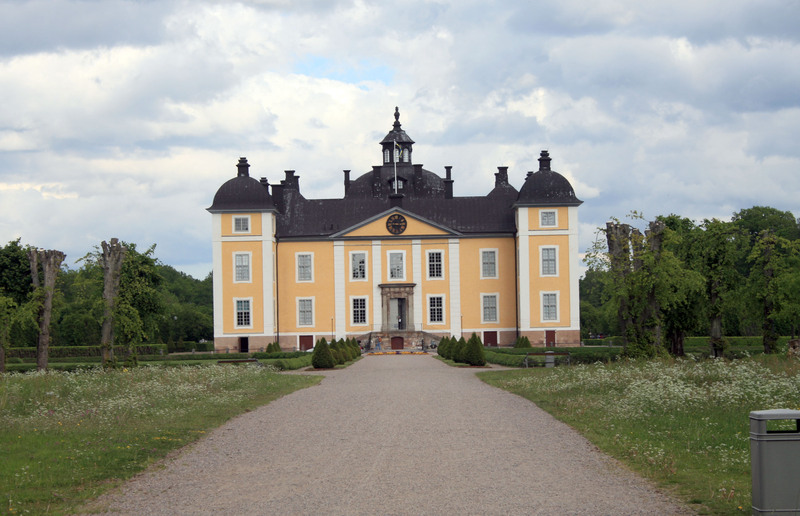 This castle is one of ten royal palaces, owned by the Swedish state and managed by the National Property Admin. As the palace is at the disposal of H.R.M., the King of Sweden, the palace admin is responsible for its activities. Gustav Vasa inherited Strömsholm in 1528 when it was still called Mölnetorp. During the 1550’s, Anders Larsson Målare was given the task of designing a fortified stone manor on the site. The one who has had the greatest influence on the site was the Dowager Queen, Hedvig Eleonora who survived her husband Karl X Gustav by some 55 years. He died in 1660, the same year as the elder Nicodemus Tessin was given the queen’s commission to draw a new palace for the site. Construction began in 1669 and was topped off three years later. At the same time as the palace, two wings were built flanking the front courtyard, but they were torn down in the early 1800’s. Several other buildings were also built nearby, including the Oldfru (old wife) Building, Page Building and Inn, two storey red wooden buildings weat of the palace. There were gardens surrounding, including a formal on the palace island with low bushes and flowers. to the east, where the riding track is now, was a pleasure garden with double linden French avenues. South of the palace was symmetrical fruit and kitchen gardens. An orangerie was also built here with foreign trees like lemon, fig and Seville oranges. Starting in 1766, the main apartment was furnished after Gustav III’s consort Sofia Magdalena was given the palace as a morning gift (a gift given by brides and grooms to their new spouse after the wedding night). The rooms on the main floor still have furnishings from her time. The third-story palace chapel was was furnished in 1735-1741, at the same time as the Stone Kitchen on the south side of the courtyard was built. When the infantry riding school was moved to Strömsholm, the palace became a military base. The upper storeys were used as barracks, mess hall and gymnasium. However, the royal apartments remained untouched and served as a museum. Today, Strömsholm is the best preserved Carolinian palace in Sweden and is open in the summer for tours. The main floor preserves the furnishings from the 1700’s, while the military mess hall upstairs has been reconstructed and the walls of the audience hall are filled with David Klöcker Ehrenstrahl’s famous pictures of Karl XI’s horses. the history of the park and palace is presented in the basement.